Helical is a company continuously searching for the next big idea and we will watch closely to see what comes from its ‘dark inventions’. 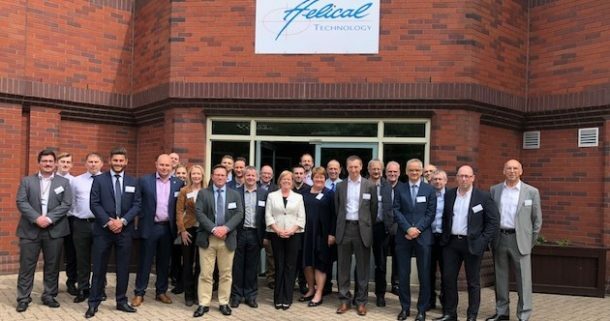 The event took place in Helical’s new Visitor Centre, which was recently officially opened by Mrs Elizabeth Morris, and it was the perfect setting for the event. Following on from Charles’ opening address, members were walked through the Visitor Centre and heard presentations from each of the department heads at their respective exhibition stands. Following the presentations there was a fascinating tour of Helical’s world-class R&D and testing capabilities in the testing area, and then members were treated to a live drive-by of Helical’s promotional 1012bhp supercar, demonstrating Helical’s revolutionary valve technology in action. A huge thanks to all of the team at Helical for pulling out all of the stops to make the event so valuable and interesting. Attendees also heard member presentations from two other organisations – firstly from Steve Reynolds of the National Physical Laboratory (NPL), who highlighted how members could access the services of NPL.